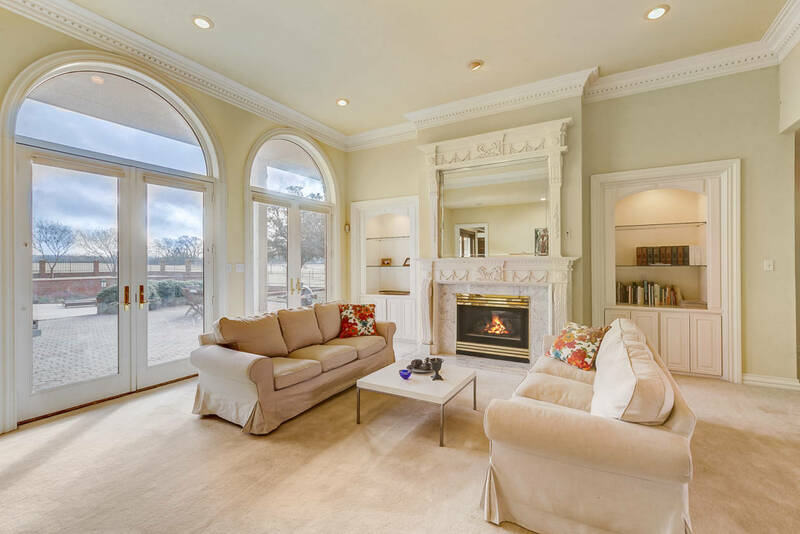 Offering five spacious bedrooms and five-and-a half-bathrooms, this highly appointed 5,858 SF Georgian-style home does not disappoint. Situated at the end of a private drive, an owner’s entrance leading to the residence provides the ultimate exclusivity. 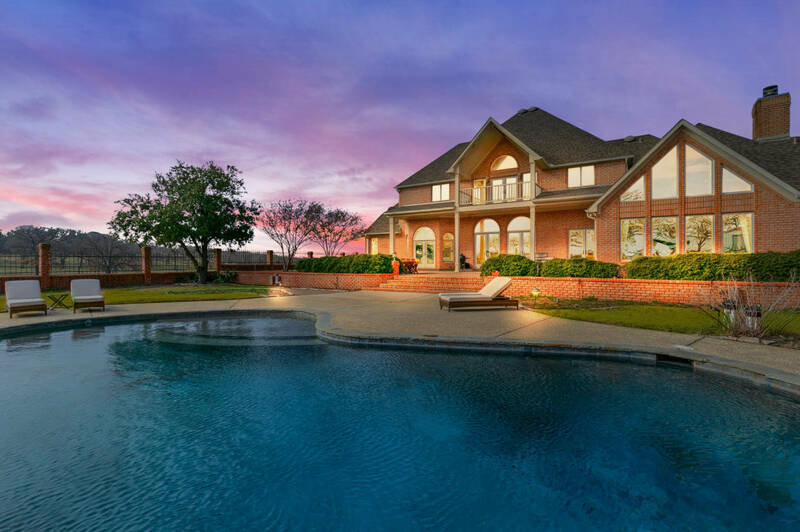 Panoramic views of the rolling acreage with scattered oak trees and native pecan trees, shimmering ponds, and horses frolicking in their paddocks can be enjoyed from almost every room. The enclosed backyard offers an extensive patio, heated pool, hot tub, and waterfall feature. There is a three car attached garage with a plethora of storage and additional parking on the paved driveway. The interiors are the epitome of understated elegance with custom craftsmanship evident in the moldings and quality of design throughout. 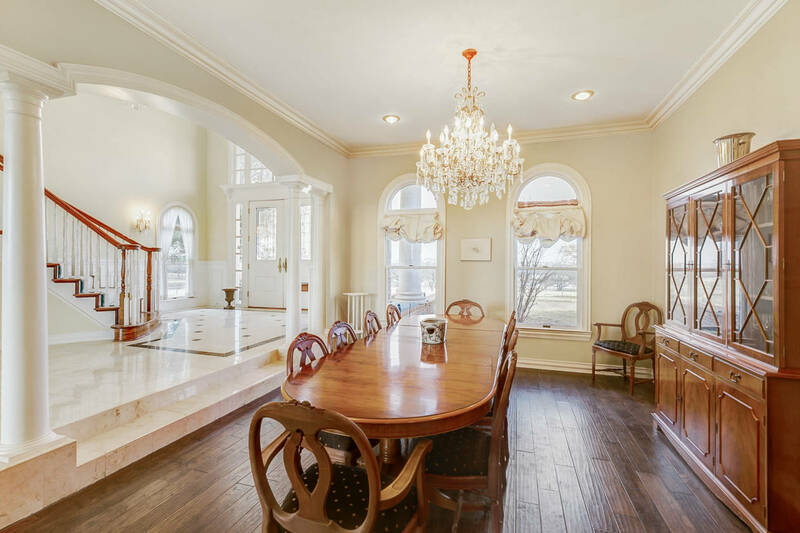 Upon entering, an elegant double-height foyer opens on to the luminous formal living and dining rooms. A sophisticated office located just beyond the entryway staircase offers a quiet sanctuary for work or reading, while a gourmet kitchen adjoins the light-filled family room with soaring ceilings, floor-to ceiling-windows, and French doors that open to the backyard oasis, making it ideal for entertaining. The deluxe master suite offers a sitting area, gas fireplace, and expansive master bathroom with dual vanities, jacuzzi tub, and an oversized walk-in closet. Thoughtfully designed, the lower level is completed by a guest suite and oversized utility room, while the second level offers an additional 3 bedrooms, game room with covered balcony, bonus room, and media room. Four additional residences are located on the second floor of the show barn. Approximately 1800 sq. ft., the ranch managers/trainers apartment offers two bedrooms, two bathrooms, and a mudroom leading from the barn mezzanine into the office separated from the main house by a door to maintain privacy in the main home. Spectacular floor-to-ceiling windows overlook the barn’s entrance and glistening pond on the South side of the facility. This residence features an open-concept layout offering vaulted ceilings and a gorgeous custom kitchen with soft-close cabinets, new stainless steel appliances, and quartz countertops. Additionally, there are two studio apartments and one one-bedroom apartment each with their own full bathrooms, ideal for staff housing. 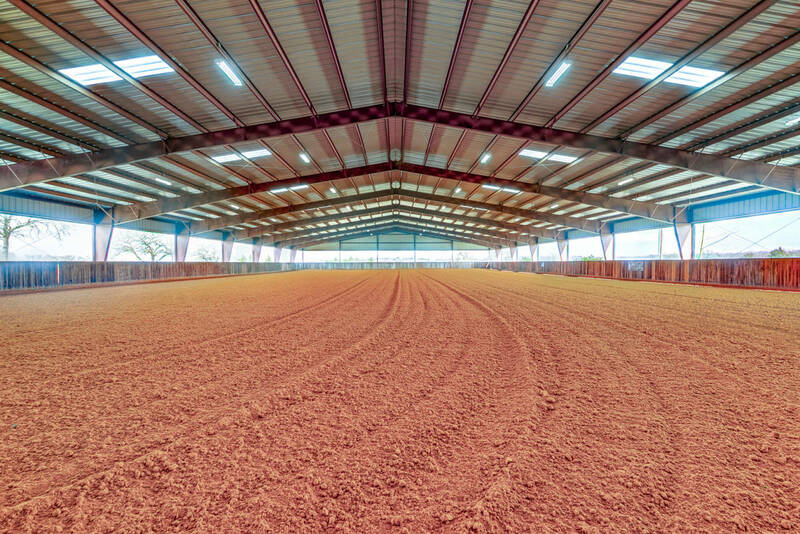 One of the newest equestrian facilities in North Texas, the fully insulated 44-stall show barn is truly beyond compare. The epitome of equine luxury, with automatic Nelson waterers, stall mats, and feeders completing each 12x12 pine-paneled stall. Complimenting the pristine barn are 4 wash racks with temperature-controlled water ideally situated across the aisle from the two oversized tack rooms featuring pine-paneled swing-around tack doors, LED lights with automatic timer, coffee room with full kitchenette, half bathroom, and laundry facility. Custom sliding doors at either side of the 3 aisles and ridge-vents in the roof allow for maximum breathability and air flow throughout the facility. Connected to the barn is a 125x250 covered arena with LED lights and professional, custom footing. Exiting the gate at the North end of the arena, a 60’ diameter round pen with professional footing is ideally located between the show barn and the cinderblock barn. 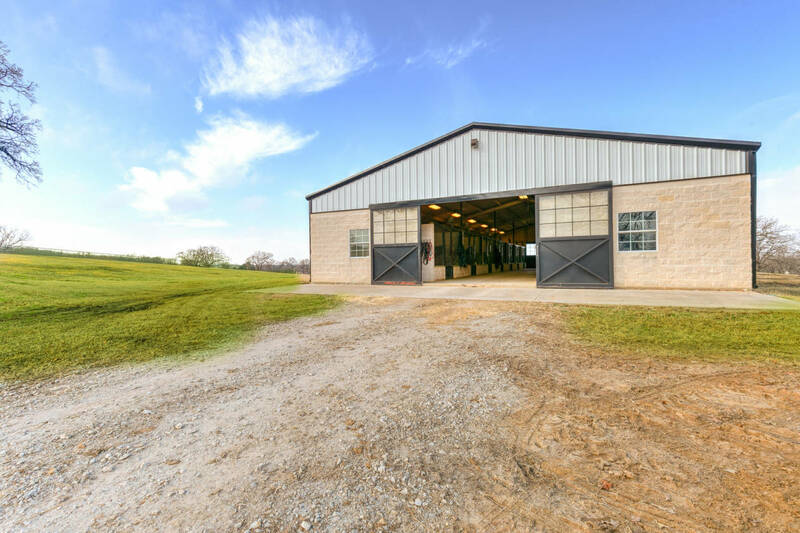 This insulated barn features 11 oversized 14x16 stalls, each offering a window, stall mats, and automatic waterer, along with an oversized wash rack with temperature controlled water, additional tack storage, full bathroom, mare palpation chute with foal keeper, and a breeding lab/office. The property also features a 2,000 sq. 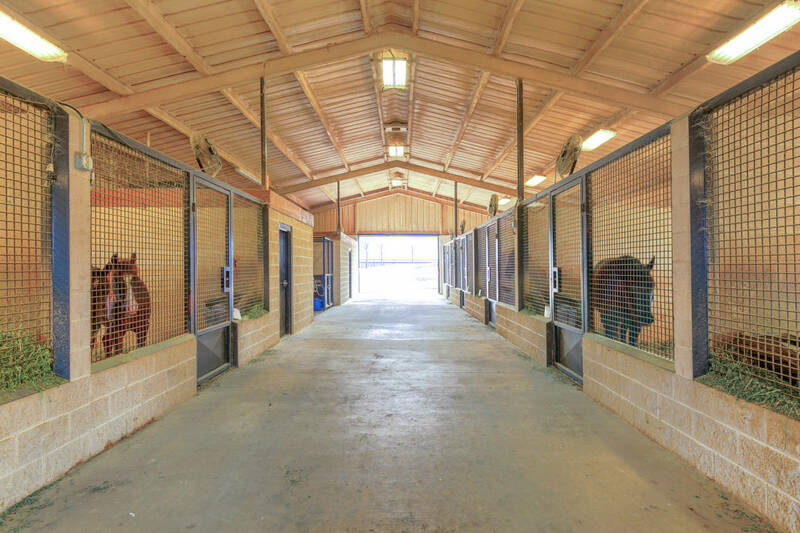 foot shop with concrete flooring, electrical, 9 10x10 stalls with feeders and stall mats, and roll-up doors at each end. This is currently being used as a stable, but could easily be re-converted to a storage building or used as a combined hay barn and overflow stable if desired. Additional coverage off of the South side of the shop provides protection for storing hay or equipment. There is an RV outlet located on the North side of the shop for traveling guests/clients. On the South and West portions of the property, there are four paddocks divided by all pipe and no climb fencing, each featuring heated Nelson automatic waterers. Just a short hack away is an open 55 acres with the 150x300 outdoor track. The ease-of-access, remaining undeveloped acreage, and magnificent size of this facility make this property the perfect candidate for a large-scale boarding and/or training operation.